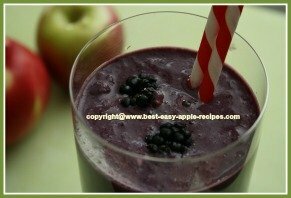 If you are looking for the BEST Recipes for Apple Smoothies, you have come to the right place! These recipes make healthy, homemade apple drinks, including both fruit and vegetable smoothies in a blender or a food processor. A juicer machine will work for many of these recipes as well. Whether you are trying to eat healthier, or you just like your fruits and vegetables in a glass, making smoothies and juices at home has become as popular as ever! Everyone, from kids to teens to adults love smoothies! Kids, even those who loathe eating their fruits and veggies, and have to be cajoled into eating a piece of fruit - love them. Teens regard them as "cool", a healthy alternative to sugar-packed sodas. And, for adults who don't want alcoholic drinks, they offer an exciting and adult alternative at social functions and gatherings. ﻿Contemporary tastes, together with a concern for healthier options in the diet, have resulted in innovative combinations of flavours of smoothies and drinks using, for the most part, fresh ingredients. ﻿By creating your smoothies you may have to spend some time, but in the long run you will save money - even if you buy some equipment to use to begin with. You will also know just exactly what is in your Smoothie! 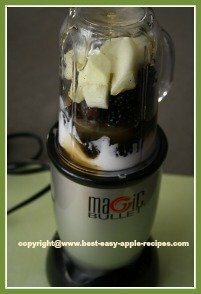 There is much over-lap between smoothie recipes and juice recipes, so be sure to check the pages at the link below for even more recipes for making that delicious, healthy apple drink! Braeburn, Empire, McIntosh, and Red Delicious are a few examples of great types of apples for making smoothies. I ♥ love my "Magic Bullet" and I recommend this very hand mini-blender! (see product links below). This amazing little appliance lets you make your smoothie in the same cup you drink it from, and there really is NO clean-up (unlike large blenders and food processors!). If you are looking for a kitchen gift for a Bridal Shower, or a Birthday, or if you want to treat yourself - this "Magic Bullet" is a great gift idea!